Though Angelcheeks is a friend to all in her philanthropic calling, she has no other children to relate to in her everyday routine. 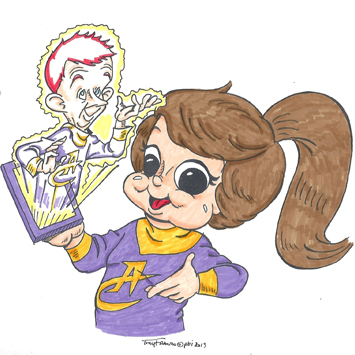 To help in this matter, Angelcheeks programmed her computer to create the perfect friend for her to confer with, complete with a holographic image and an artificial intelligence. The result is the nerdy “Blip,” named after the sound he makes changing screens. Despite his logical nature, Blip’s emotions sometimes overwhelm him due to the crush that he developed on Angelcheeks.